iryani! BDoesn’t that word conjure feelings of joy and comfort? Who doesn’t love this pampered, fragrant, rice delicacy that reigns supreme as the world best one-pot meal? For many of my dear readers, today’s post is a long-awaited one. 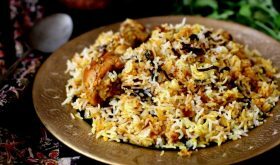 The question I keep getting asked is “how do you make chicken biryani?\ Ever since I have been blogging, I have received many emails requesting for Hyderabadi chicken biryani recipe. At last I get to blog the recipe of the quintessential ‘home style’ Chicken Dum Biryani from the royal kitchen of the Nizams. A chicken dish that calls for an elaborate process and requires lots of TLC aka ‘tender loving care’ while preparing unlike the quick pressure cooker biryani. There are two versions, Kachha (raw) and Pakki (cooked) Biryani. Today’s recipe is basically a Hyderabadi kachha style of biryani where marinated raw chicken and partially cooked basmati rice are layered and cooked on dum, over low heat. 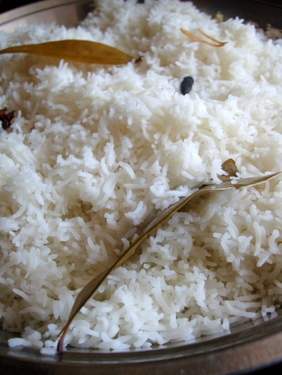 Traditionally, biryani is slow cooked over firewood where each rice grain appears separate, non-greasy and is flavorful. And the chicken is super soft, moist and tender. You can achieve the same flavor while cooking over stove top too. I prepared this biryani a couple of times. 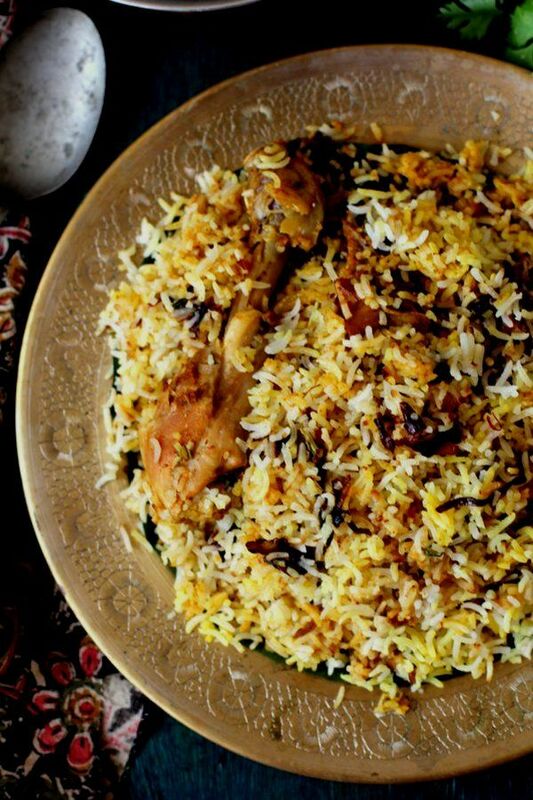 This is a no-fail recipe for Hyderabadi chicken biryani that’s perfect. Once the chicken biryani is cooked on dum, as you open the lid, the kitchen smells fragrant, rich with the reassuring aroma of pure ghee and saffron and the chicken cooked to melt in the mouth tenderness. Perfectly spiced biryani! What kind of rice is used to make biryani? If you are preparing authentic Hyderabadi chicken biryani recipe, use only the best quality aged Basmati rice. I have used few brands like Kohinoor, Daawat and India Gate basmati rice. But the best biryani rice in terms of the long grain, aroma, and flavor would be India Gate. The aroma is simply out of the world and when cooked each grain is separate, and cooks beautifully. How do you cook basmati rice? For 1 kg basmati rice, use at least 6-7 liters of water. Add the spices and salt (as mentioned in the recipe) to the water and allow to sit for 20-30 mins. Drain the water from the rice into a larger vessel and bring it to a rolling boil. Add the basmati rice at this stage and cook on high flame for 6-7 mins. Reduce flame to low medium and cook for a few more mins. You have to check at regular intervals while the rice is cooking by pressing a rice grain between your thumb and index finger. It should be undercooked, just slightly soft on touch yet still grainy in texture. When it’s just half cooked, immediately drain the water. Do not allow the rice to cool completely. Start layering the rice at this stage or within 2-4 mins of straining it. Where does the aroma of the biryani come from? The aroma of chicken biryani comes from basmati rice, desi ghee fried onions, fresh mint leaves, and saffron infused milk. These go between each rice layer. Mint leaves lend a lovely aroma and flavor to the biryani but it has to be used in moderation. Do not skimp on it or go overboard with mint. 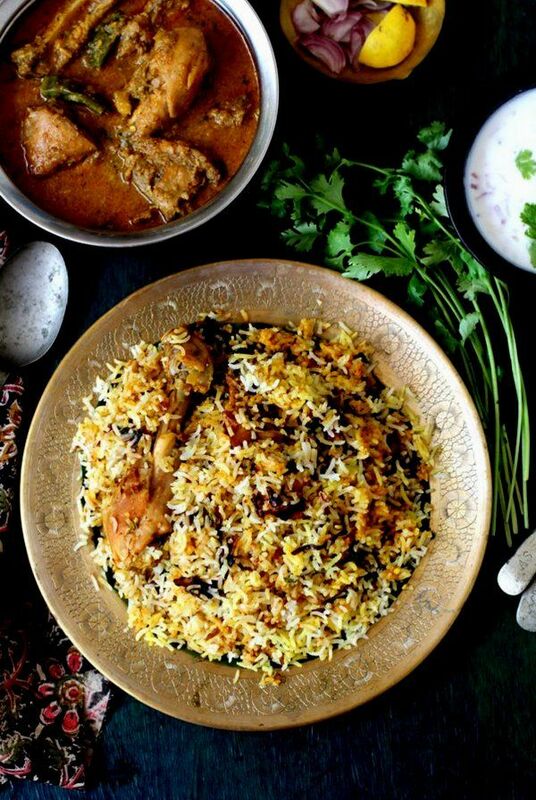 How to make soft and moist chicken in a biryani? The key to a soft, moist chicken is the marinade and marination time. We do not want a stringy chicken. Salt, lemon juice, green chilies, ginger garlic paste and biryani masala are extremely important ingredients for the marinade, both in terms of flavor and texture of chicken. You have to marinate the chicken for at least 6 hours. It’s ideal to marinate for 12 hours (marinate overnight and refrigerate). What is the ratio of rice to chicken while cooking biryani? For 1 kg rice, you will need to use 1 kg chicken. You have to keep a few other aspects in mind while making the chicken biryani. The chicken has to be marinated for at least 6 hrs and if running out of time then two hours will do. But the longer the better. I suggest you do not compromise in this aspect. Add sufficient salt to the marinated chicken. You should remember to add salt to the water while boiling for the basmati rice. (a very important crucial step that is overlooked many a time). It is also crucial that you use the right cooking vessel to prepare the biryani. Use a flat base, heavy-bottomed handi or vessel. It is important to seal the vessel while the biryani is cooking on dum and not allow any steam to escape. You can make a dough with wheat flour/atta and water, roll out into an elongated shape similar to a rope. Run it along the edge of the vessel and the lid and pinch to seal. You should not follow any shortcut methods and all the ingredients listed below are a MUST. In other words, there are no substitutes for the mentioned ingredients. These are the aspects that need to be taken care of while making chicken biryani. 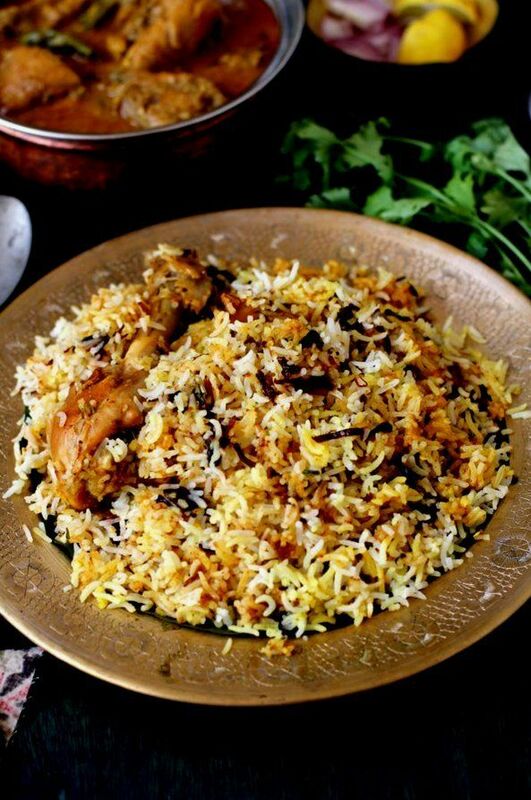 This is my most favorite Hyderabadi chicken biryani recipe. Do give it a try and share your feedback in the comments. You can share pictures of the biryani too. I am on Instagram, Facebook, Twitter and Pinterest, so do share your feedback or ask your queries as well. Heat 3 tbsp oil + 1 tbsp ghee in a vessel, Once hot, reduce flame and add the sliced onions and fry till they reach a nice golden brown color. Remove the fried onions with a slotted spoon immediately as they quickly turn a darker color. Set aside to cool. Marinate chicken with the ingredients called for 'marination' along with three fourth of the biryani masala powder and 3 tbsps of the fried onions. Keep aside for 4 hrs or a min of 1 1/2 hrs. While the chicken is marinating, work on rest of the preparation. Add the saffron to the lukewarm milk and combine well. Keep aside. Cook basmati rice in lots of water along with bay leaves, cloves, cinnamon, cardamom, marathi mogga, cardamom, oil, salt till its half cooked. Strain the water and spread the rice on a large wide plate. Take a wide deep vessel to prepare the biryani. Add the leftover oil+ghee mixture (after frying the onions), add the marinated chicken and spread out over the vessel. Cook on high for 2 min. Add a tbsp of oil over the chicken pieces. Reduce flame. Spread half of the rice over the chicken layer, pour half a tbsp of ghee all over the rice, add half of the caramelized onions and spread over the rice. Next, sprinkle half of the chopped coriander leaves, half of the mint leaves, and a large pinch of biryani masala. Pour 1 1/2 tbsps of saffron milk over the rice. Over this layer, spread the remaining rice. Again pour half a tbsp of ghee all over, add remaining caramelized onions and spread over the rice. Finally, sprinkle the remaining chopped coriander leaves, mint leaves and a large pinch of biryani masala. Sprinkle the remaining saffron milk over the rice. Place lid and over the lid, place a heavyweight. Seal the edges with wheat dough. Cook on high flame for 2 mins. Remove the vessel from the stove and place an iron tawa. Increase the flame and allow the tawa to turn hot. Reduce to low flame and place the biryani vessel on the iron tawa and cook biryani for 20-25 mins. Turn off heat and do not remove lid for 10 mins. After 10 mins, remove the lid, mix gently and serve hot with raita and chicken curry. Ideally, if the chicken is marinated the earlier night and refrigerated, it would be best. lovely dish and lovely pics….i can imagine the flavors reading the recipe. Waiting for this recipe for a while! Looks Yummy!!! Making it right away. Your blog is awesome. I love your blog. I tried murg methi and murg musallam, came out really good, but did not get the color. In fact they tasted good. But I felt the spice level is very less. I added 3 times the chilli powder to that of your recipes. Can you please let me know if I made any mistake? I am not a good cook. I want to try this biryani but have some doubts before i cook. should we place the biryani vessel on iron tava? what if I have only a nonstick pan? (ii)what is your rice cup size? Can you please upload a pic of the cup too? Swetha, we are all learning and with time and experience we become better cooks. 🙂 Iron tawa is the best but having said that you can use a non-stick pan but use an old one which is not in use. I use US measurement cups but the teaspoon and tablespoon are what we use in India. I should probably do a post on cups and spoons soon. Update (21st Feb, 2010): I have done a post on measuring spoons and cups. We were waiting for this recipe for a very long time. Hi Sailu, your website is very good and I’ve tried various recipes that you have posted and they have come very well. I have one question with this Dum Biryani. In the last step, should the biryani vessel be placed back on the fire or on the iron tawa that was heated? Glad to note you enjoy the recipes, Geetha. 🙂 Place the biryani vessel on the iron tawa and cook on low flame. if it is for two persons is one kg chicken too much. i’m new to cooking and where do we get saffron? seven months ago my frnd bought it frm a nearby market just for 60rs but i heard it is costly. how can we find it as genuine one? Marathi moggu are dried caper fruits. They are available in more super markets. You can half the recipe and prepare for two to three persons. Saffron is expensive and good quality saffron is available in most super markets these days. i’m very fond of ur blog sailu garu and this one is awesome. Sailu, Thanks for this recipe. I’m a fan of your blog not only for your recipes, but for the patient, generous way you answer queries from your readers. You may not realize it, but you’re helping a lot of cooks, who are at different levels, get better at their home cooking. Sailu, I usually make biriyani in cooker. But I love the typical dum biriyani, and haven’t got it right at all. I am going to try this recipe hoping it works out for me. But I don’t have a large vessel to keep the dum, do you think I can arrange the items in a foil and put it in the oven? or can I use the cooker without the whistle to put the dum? Let me know. Thanks. Kanna, you can use the pressure cooker without the whistle. What you can do is place a stainless steel glass over the cooker nozzle. OR you could place a lid that fits your pressure cooker and seal with wheat dough and then place a heavy weight over the lid and follow the rest of the procedure. You can also try cooking in the oven by using an oven proof dish and greasing it and following the rest of the procedure. Seal the dish with two layers of aluminum foil and bake in a pre-heated oven at 200 C for 25 mts and reduce temp to 150 C and cook for another 55-60 mts. Turn off oven and allow to stand in the oven for 10 mts before removing it. Have you tried the oven method? It seems like a long time in the oven. Already made this Biryani. It was a Super Hit. Every body loved it. Thanks a Tonn. This is not kachi biryani. In Kachi Biryani we dont cook the rice separetly. In Kachi Biryani, Rice and Meat are cooked under dum arranging them in layers. Kachchi ghost ki biryani: It is prepared with meat marinated with spices overnight and again soaked in yoghurt before cooking the meat sandwiched between layers of fragrant long-grained basmati rice. It is then cooked by sealing the handi (vessel) with a layer of dough, and is cooked on dum – steaming over coals. This is a challenging process as it requires meticulous attention to time and temperature to avoid over – or under-cooking the meat. Pakki biryani: In this type, the meat marinating time is shorter, and the meat is cooked before being layered with the rice and cooked in a dough-sealed vessel. In Pakki Yakhni (with cooked gravy), the ingredients are already cooked before baking. hello guys, i totally agree with sailuji as far as definition of kachchi and pakki biryani is concerned. ms. kavita needs to correct herself with sailuji’s opinion. great..! sailujee keep it up. nice work. thanks. Wish you could see me, I am salivating! Love the biryani Sailu, Wish i could eat it right off of your pictures. I will make it this weekend no matter what!! Lovely Biryani, Sailu…… Wonderfully made & those illustrations are perfect too…… Really looks cool & perfect….. I loved it a lot & saved it for my future encounters too…… I would love to make it & when I do, I would surely let u know…..
That is a mouth-watering recipe. However, can I ask if the chicken can be substituted by vegetables and follow the rest of the recipe as it is, as we are vegetarian? I made egg biryani in a similar way, but put it on very low flame instead of tawa, what is the purpose of putting it on tawa? Yes, you can substitute with vegetables, take care to reduce the cooking time. Placing the vessel over the tawa ensures that the biryani/chicken does not burn and indirect heat works best. Hi Sailu – can you please post the recipe for Nilgiri Chicken Korma which you have shown along with the Biryani recipe ? Thank you – I love your website. Definitely, Vidya. Will post it today. looks perfect. I ll make it again with exactly the measurements u mentioned. Can you please clear few doubts? Is it necessary to cool half-cooked rice before layering? don’t we need to add pudina leaves while layering? How to get white rice and coloured rice (like the restaurant versions)? Its not really necessary to cool the rice. 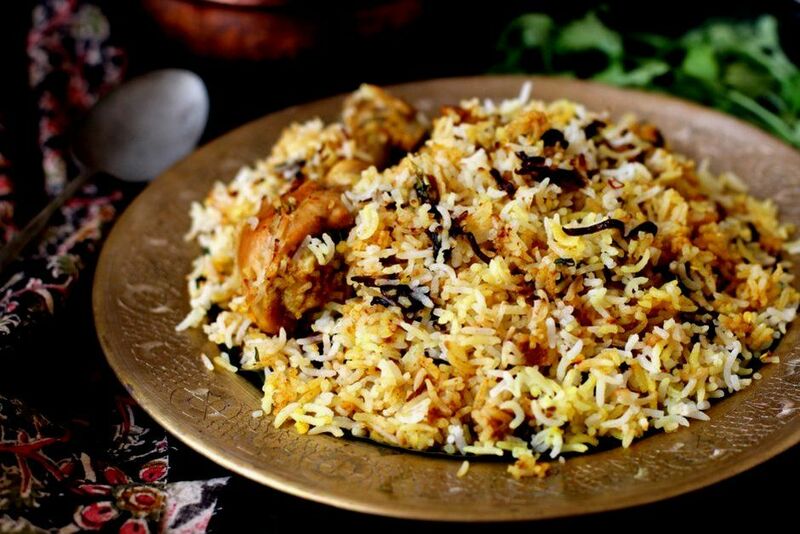 After preparing the rice if you are not immediately layering the rice for the biryani, its better to spread the rice on a wide plate since it might become more soft than required due to the heat of the rice vessel. If you are layering the rice immediately on cooking there is no need to spread the rice to cool. Adding pudina leaves is optional for the layering process, you can add few leaves along with coriander leaves. I have added few mint leaves while the rice was cooking hence I did not add during the layering process. To get the white and colored rice like restaurant version, DO NOT combine after removing the lid of the biryani. Serve the biryani by not combining the contents of the biryani vessel. Hope this helps. Thanks for your detailed guidance. It came out wonderfully aromatic, delicious and colourful. Been following your blog for sometime now, tried a few including Methi Matar Pulao and Hyderabadi Biryani. Both turned out good. Keep going, you are doing a fine job! It’s really great to see hyderabadi briyani in your site. I’ve think I’ve got good HDB recipe. I’ve tried hyderabadi briyani quite a few times but it always ends with a bad result. The pbm is am using electric stove and when am doin the dum process the chicken at the bottom layer gets burnt. Could you tell me how to avoid this mess? The reason is electric stove, I guess. I have heard about this issue earlier too. Do you place a tawa on the burner and then place the biryani vessel to cook on dum? Did you try without the tawa and placing directly on the burner to cook on dum? I really do not know the solution for this, Shriya. Sorry about that. My family used to always admire my cooked Biriyani which was a pakki Biriyani. I had prepared your Biriyani on Sunday and it turned out to be the bestest Biriyani I have ever cooked. As the Chicken is getting cooked in the marinated masala, the steam is mesmerizing each grain of rice with awesome flavours. Thank you for the long awaited authentic recipe. Could you please tell me what changes do I need to make to this recipe to replace chicken with mutton? Marinate mutton with required ingredients overnight in the refrigerator. Next day, pressure cook the meat without water. See that the water is evaporated. Add lemon juice and combine. Follow rest of the procedure. You made my day. Always worried when cooking non-veg. And on top of that I have tough critics to impress. I made this yesterday for my husband’s birthday. He liked it a lot better than the restaurant versionand also told me “save the recipe, don’t loose it. we will make it this sunday”. I told him I got it from a well tested chef’s kitchen. Thank you so much for a wonderful recipe. Your website is awesome. When ever I go to your website, it reminds me of my Moms kitchen in India. Thanks for all your effort in posting all these recipes. What kind of red chili powder are you referring to in this recipe? Would it be Kashmiri Mirch? or something spicier? Its Kashmiri Red Chilli pwd. can i use electric cooker for preparing this briyani? i saw u r samosa it was awesome. i visit u r site every week to know wht u have uploaded & suggest u r to my friends. u r doing a wonderful job. continue this good work. can u post some soup receipes with spinach for my 9 month old baby, will be more helpful. I have not tried this recipe using electric cooker. You can try preparing small quantity and do leave your observations if you try this biryani using a electric cooker. I have tried this in electric rice cooker, it came out very well. I’ve impressed my family by serving the biryani, which I prepared it for the first time while following your recipe. It was a great experience and all the credit goes to you. Thanks a lot, you have helped me a lot in this!!! Thanks a lottttt once again…. I will be making your egg biryani tomorrow with my best friend and I know it will turn out great, ’cause your recipes never fail to impress. Thanks a ton for sharing such lovely recipes. Today i tried this biryani n it came out really great!! !My hubby is really happy n was showering compliments.Thanks to u n all the credit goes to u! !Everything i prepare is from ur website only.U r a great guide for beginners like me.Thanks a lot!! hi Sailu, I tried this recipe over the weekend and it came out superb! I usually do the ‘pakki’ version of Biryani but this is the first time I tried the ‘kachha’ version. I was a bit anxious as to how raw chicken would be cooked with partially cooked rice, but it came out even better than any other chicken biryani I ever tried. My friends and hubby who tasted felt like it came out just like the biryani in restaurants in India. I am glad I found a perfect never-failing biryani recipe and attribute all the compliments to you for providing the wonderful recipe! Tried the Hyd. biryani and nilgiri chicken over weekend. I just have one problem and was wondering if you could help with it. For biryani for 2 people, I followed every step and used 1/2 the quantity of ingredients mentioned in your recipe. The biryani turned out good, but it was white in color even after mixing. There was very little gravy in the biryani. The chicken also turned out white and not brown. Could you please let me know where did I go wrong or what should be done to get more gravy in the biryani? The overall dish was great bcoz the nilgiri chicken was awesome. Sailu garu, quick question. So the basmati rice is cooked completely but not half cooked or anything? It’s my brothers 21st birthday this weekend and have a few cousins coming. I normally cook dum biryani in the oven and half cooked but never tried the actual dum style as it’s a little difficult with my electric stove here. But now I have my hands on a portable gas stove so planning to try. Basmati rice is half cooked when biryani is prepared dum style over gas stove. Do not cook completely. ALL U R RECEIPES ARE AWESOME, THIS ONE IS ALSO HIT IN MY HOUSE, SUNDAY LUNCH WAS FABULOUS. THANKS. I have failed at making Biryani so many times that I was very nervous about trying this recipe. I had some time on hand and all the ingredients. I gathered up some courage and made this last night. I followed your recipe to the T and my god..it turned out just awesome…awesome..awesome..Thank you so much Sailu. Yes, its a kilo of rice. i had seen in one episode of tata sky,a biryani was prepared of mutton without adding water to it.but can you tell me hw much time it will take for all this,n if you have any suggestion over this.the recepi was of dumb mutton biryani. 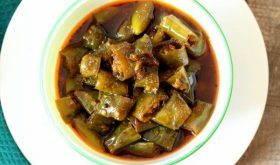 Awesome blog on Indian Recipe’s (Andhra). It really helps me a lot. I regularly prepare Non-Veg dry items, and love to eat those. I tried preparing Dum biryani once. But no luck. Not able to taste it at least. But after I looked at this, I love to eat the biryani prepared by me. Sorry to ask here. Do you have any post on Nellore Chicken Curry? I tasted once in Nellore. When I was in Sunnyvale, California I tasted it once and enjoyed eating it continuously for 3 months everyday twice. I tried so many times but failed. Glad to learn my blog is of help to you. 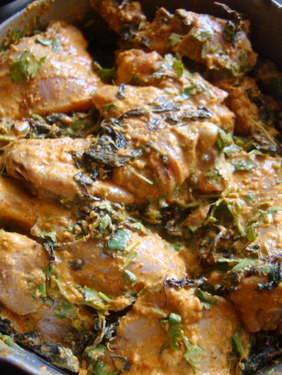 I am yet to post Nellore Chicken Curry recipe. I am both a novice cook and a new visitor to your site. I am going to try out this biryani tomorrow for guests. Could you please tell me re point 2,: – What is ‘lots’ of water? Would, say, 8 cups (2 cups per cup of rice) be right? Also, what would half-cooked be, in terms of time – about 10 mins after the water starts boiling? What wd the rice look like? Sorry for the delay. I just read your query. You can add about 8–10 cups of water. When you press a grain, it should not be fully cooked. It should be undercooked, and slightly soft on touch. Cooked a biryani 2 days ago, am seeing your recipe today and want to try it. I think i can use capers to replace marati mogga; but curious about pudina leaves and mint leaves in recipe. What please is difference? Love this site. thank you. This is superb Biriyani, which all in my family loved very much. Thank you sailu for giving such a tasty recipe. Hi Sailu! My husband made this for me and I loved it. He loves your website. I am lucky he found your website. Love and thanks. first of all, thanks a lot for teaching me how to cook hyderabad dum biryani. i tried lot many times, but somehow landed making either chicken pulav or burning the chicken below. i tried to cook following each step properly. but one thing which went wrong was that the spices didn’t peep inside the chicken. the chicken seemed very bland. and also, the overall effect was not like hyderabadi dum biryani. usually i have less or medium spice, but this was still less. can you suggest me how to avoid this the next time when i prepare dum biryani? sailu ji wah! kya baat hai! dekhte hi maza aagaya..
What is ‘marathi mogga’ and star anise? Are we Bengali people call these two spices in different names? If I don’t get marathi mogga and star anise what alternative spice I can use instead of these two spices in preparing Hyderabadi chicken kacchi biryani? Please advice. You can use 3-4 drops of kewra essence. Otherwise you can omit saffron and follow rest of the recipe. Hello Ms.Sailu, i am Ganesh from kuwait. but i am from vizag. it is very nice to see that a great lady is also from the same city. any way thank you very much for your recipe of Hyd dum biryani, infact i am enjoying cooking, cooking is my passion and weekends i spend in the kitchen. your idea is very good it is very much helpful for people like us (forced bachelor). go ahead with some more recipes. thank you. i tried to learn from many sites ,but it is easy to understand and do . can v cook vegetarian dum biryani in same manner instead of chicken can v use vegtables. Yes, you can use vegetables in place of chicken. I make biryani, pakki style. Would love to experiment with kaccha style of cooking it. This recipe does look good. Can i prepare the same in an aluminium cooker? Its just that i shall place some other lid on that and wrap the sides with wheat dough….will it work? I dont have a dum. Can we make the biryani in oven. Please advise. I made this biryani an year ago and it was not great and just fine.After long,i’m making it again.Its cooking and just hoping to look and taste just as shown above.btw i have special thanks for you for making me a pro at cooking. I’ve tried all of ur biryani recipes n they came out really yummy :)…Can u also pls post a recipe for shrimp biryani or shud i just replace the chicken with shrimp?Thank you for ur wonderful recipes. Everything is fine except the rice. For Biriyani the rice is special. Here I feel the rice has let you down. May be the rice is too new or too old or got cooked too much, thats why it is looking like normal rice instead of authentic long grain Basmati rice. Try changing the rice and make the biriyani again….you will find the difference. The Biryani came so well thank you so much.I’m a big fan of you and your site. I am very passoniate about cooking, specially non veg food. right now I am living in USA and I also cook good chicken biryani, I usually use readymade biryani masala, I cook chicken in biryani masala and khada masala, prepare rice seperatly & put layer of rice and cooked chicken in silver foil tray and put it in grill oven for 30 mins. I am very much excited to try method you have mentioned above but I dont have iron tawa any other option for this? and here in US we have electic coil and not flame. is 20-25 mins time enough to cook chicken? I’ve made this… and the recipe seems great. I followed it exactly to the very last word. I marinated my chicken for over 8 hours, but after cooking it seems flavorless… in fact the whole dish seems to lack the hyderabadi biryani flavor that I know and love. What did I do wrong??? Can anybody help? This is my 3rd attempt to make biryani and it always seems to come our with no flavor to it. I grind my own spices and everything… but still… it tastes like chicken and rice with a hint of flavoring, and absolutely no heat. The curries I make turn out great… But my biryani definitely needs some works. Can someone tell me why my dish, chicken especially, may be lacking much flavor??? I have followed a similar recipe but I did not use the saffron milk.. It was pretty good.. Maybe you should add more green chillies or red chilli powder while marinating and don’t overdo the time.. And the spices can be varied here and there in quantity because the author’s palate maybe different from yours..
1. When marinating chicken, wipe it dry thoroughly and make a few thin slits in the meat and then put the pieces in the masala. This will help it stick and result in a more flavorful chicken. 2. Use thick yogurt, If you live abroad, use plain greek yogurt. This also helps the masala to stick to the chicken itself. 3. You could also put all the marination except the yogurt first, massage the chicken a little bit and leave it for an hour or so. Then add the yogurt as a second step in the marination, mix again and leave it for 2-3 hours. when u wash chkn, very first apply lemon juice n salt on it. After some time, apply ginger garlic paste. Garlic shud be much in quantity compare 2 ginger. Then pour biryani masala n yogurt on chkn seperately. Mix well. Keep it aside atleast for 45 mins. Then start making ur biryani. Its my secret tip. Try it n cm back with ur comment. Make fresh garam masala,use only shah Zira,if you live in India try to buy your shah Zira for. Jahangir ali dawasaaz near gulzar house area of charminar,May be you can find his number in yellow pages. 2. Put slit marks on the chicken. 3. marinate the chicken in it overnight. 3. Put this mixture over the bowl with chicken, so that all the chicken are covered. 4. Do not stir or disturb this mixture. 5. Refrigerate for 2 to 4 hours. After this the chicken would be ready for use in a Biriyani recipe. If you are using lamb, Add tenderizer[Papaya paste] in the 1st marination. A very flavorful biryani. enjoyed it. thnx. All the recipes I’ve tried so far from your blog turned out very well. I want to try this biryani recipe for my daughter’s upcoming b’day party. (I’ll practice it couple of times before the party). One question, can I do this in conventional range oven? can I get the same taste? what are the variations for doing in oven? I am not very comfortable cooking rice on stove top :). Moreover, on the party day it’s easier for me to cook in the oven, don’t have to worry about under/over cooking chicken or rice. Thank you so much for all the delicious recipes!! I have just taken up cooking and looking forward to trying out your amazing recipe. However I had one basic doubt, when you say 1kg chicken is it boneless or with bones? Appreciate if you could let me know that 🙂 Great posts! Thanks! Is Mutton Biryani same porcedure? I am nikki.This chicken biryani will be so nice. I also like chicken. You like chicken? I just made this for my husband last night… it was just amazing! I am mostly veg and was planning to eat something else for dinner, but after having a taste I couldn’t stop eating! Thanks so much for sharing your knowlege and talents with us. can you pls pls explain to me about step 7 as i never make briyani at all. what is wheat dough. Pls explain to me, tq vy much. Thanks for your detailed recipe. Tried out today it tasted good but still need to know like for how many minutes should we boil the rice for par boiling. I cannot really give you a time frame for cooking of the rice. When you test a partially cooked grain of rice, it should not be soft on touch. thanks for ur idea…we r making it now n later we will give comments…. If you do not have saffron, use kesar/yellow color. First time I tried chicken biryani…and its perfectly awesome. How would the quantity of ingredients and cooking times change if I had to make biryanai with 3 kgs of rice and 3 kgs of chicken? I recently started following yo ur blog…I do really appreciate it as my husband is a picky eater I tend to run out of recipes. I was looking forward to make this recipe but following your instructions of using all your ingredients. I cant find the marathi moggu in USA Indian Stores. Is there any way I could work it out without losing the taste of the Briyani. You can omit it. Not a problem. I made this. It was awesome. Thanks for the recipe.Can i use the same recipe for mutton biryani? This is the awesomest Biryani I have ever made.. Everyone at my home just loved the aroma and the taste of it when I prepared it for the 1st time.. Thank you for the wonderful recipe..
i was looking for a dum biriyani recipe and had saved yours a week back. i prepared it today. i followed each step in the recipe as it is. i want to say that the aroma after opening the lid was awesome, the caramelised onions and everything but for the rice. u havent mentioned in your recipe to run the rice under cool water after it is parboiled. this made the rice slimy as it had the starch. but all in all an awesome but an elaborate recipe. iv jus got married .. i started cooking only recently..can you pls tel me how long should i keep the dhum for half kg of rice..
also how long should the rice be boiled to get the half cooked stage..
Its not possible to give exact time for half cooked rice. It depends on heat control, amount of water added to the rice as well as the variety of rice being used. You will have to keep checking every few minutes to see if the rice is half cooked. Regarding dum, just follow the steps 7 and 8 to the ‘T’. You should have no problem. I have Tried it , its one the best styles of making and gives the Nawabi taste.. …..
Hello, I tried this today, it was my first attempt to make any biryani,& it turned out very well ! my family simply loved it! The flavours are unbelievable! Thank you for this fantastic recipe! Your all recipes are heaven and this one is the best one. Though it was my first attempt for biryani, it turned out so well that it look like a professional. Thank you so much. You are a big help. Hi Saily. Can u please let me know if u add some gravy anytime? I have tried ur recipe earlier and it went so brilliant. Not sure what went wrong yest when i tried with half kg chicken and 2 cups of rice. Gravy was not der at all and even the brownish effect on the chicken was not there. Chicken was nice and soft but was white in color and goodness if the yoghurt was less to form gravy.. and yes, i did not add any water at anytime..
Hi Sailu, the dish tasted awesome, thank u so much for the recipe. I wanted to know if we could cook (chicken biryani) it in an oven, many of my friends said we could do it, so please let me know the procedure for cooking it in an oven (not microwave). Thank u…. Haha yeah what is Marathi mogga? Is it similar to clove? Awesome biryani tried it today i and my dad made it it came out good but didnt get the colour. never mind. can you tell me how to make homemade italian pasta? Following your recipe has always produced yummy biryani. But I always end up overcooking the rice a little bit. I use your recipe and prepare it in the oven. Next weekend I am planning to make it for a get together of international families. I wish to get it right. Please help me to get it right. How can I know if the rice is half cooked? Well, when you hold a piece of rice grain, it should not be soft but have a slightly grainy texture. I guess, a couple of tries and you should be able to get the hang of it. hi…for two person hw much ingredients want?pls show the size of ur measuring cup…..
i made this and it turned out to be amazing…. I followed the recipe exactly and the biryani turned out fantastic. Thanks! I tried this recipe couple of times..and it turned out to be amazing and delicious,my husband loved like anything and really thankful Sailus ,May we get different recipe in future, Thanks…………….. I think the Basmati rice have to soaked earlier(we should not cook it and add to the fried chicken) and then put inside the vessel and pour some water to cook it along with the chicken.. If I make veg biryani then how do I make use of biryani pwd. When and how much should i include? Its great to see such a detailed step by step Recipe guide, thanks for sharing this awesome article. I followed the same procedure but ended up making not so good. Seems like I have over cooked it. You can marinate with lemon juice. Use one more lemon other than called for in the recipe. Simply awesome recipe hyderabad chicken dum biryani. Hi mam, is the cup measurement rice cooker cup or regular measuring cup? I used 1tbsp salt to marination instead of 1tsp salt. Can I compensate this by decreasing salt by same proportion while cooking basmati rice?? And 1/2 cup of coriander leaves means size wise right ?? Or should we add 125gms of coriander leaves(as each cup means 250gm). And can I cook basmati rice in pressure cooker by using half the amount of water required to cook the 1kg basanti rice so that I don’t have to check every 5mins whether rice is partially cooked or not and it also minimises the chance of overcooking. No, do not compensate by decreasing salt while cooking rice. Add the required amount of salt to the rice. Take a small bunch of coriander leaves and cut the roots, wash and finely chop. Add the chopped coriander leaves to fill half a cup size. It is not weight wise. No, you cannot cook basmati rice in a pressure cooker. Cook it as called for in the recipe. No compromise on that count. Hope this helps. Any other queries, do ask away.